Ito Romo with Lalo. Photo by Robert Salluce. Refugio “Ito” Romo, Ph.D., Associate Professor of English Literature and Language, was one of 17 writers writers to be inducted into the Texas Institute of Letters (TIL), a distinguished honor society that celebrates Texas literature and recognizes distinctive literary achievement. Joining Romo in this year’s class of inductees is three-time-Oscar-nominated screenwriter and director Wes Anderson and playwright and Broadway actor Eugene Lee to name a few. Members will be officially inducted April 26 to April 27 in McAllen, Texas. To view the complete list of inductees, visit bit.ly/tip-ito-romo. Romo was born and raised on the border in Laredo, Texas. His recent work, dubbed “Chicano Gothic” and “Chicano Noir,” shows the dark and gritty life along Interstate 35 through South Texas, where his family has lived for nine generations. He is the author of The Border is Burning and El Puente/The Bridge, published by University of New Mexico Press, and in German by Europa Verlag as Der Duft der Maulbeeren. He has been included in the Akashic Noir international anthologies series. 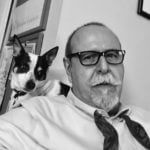 Romo has also served as guest editor for the art and literature journal Arcadia, which he subtitled, The New Chican@, a resurgence of social realism in the writing of Mexican-Americans along the U.S. Mexico border.